Shakespeare Didn't Use Scrivener—Why Should I? Shakespeare Didn’t Use Scrivener—Why Should I? Well, let’s dispatch with the title question first: I’m not Shakespeare. No, no, don’t try to soothe my oozing writer’s wounds, I can take it. Aside from that ounce of obviousness, there’s this: no coders had the sense to put together Scrivener in Shakespeare’s day—in fact, his choices of apps (basically a quill pen and maybe some foolscap) were pretty bare bones. He didn’t do too badly with them, though. But I think if good Will had access to the program, he would have found lots to like in its flexibility in shifting and sorting blocks of text, storing character descriptions and synopses, organizing scenes into relationships, and having a repository of reference materials like links and images. Willie would probably like being able to export to ebook formats too: King Lear would make a Kindle’s screen crack with its stormy scenes. I’ve only been using the program a couple of days (and no, I’m not pimping any affiliate marketing here), so I won’t go deeply into its considerable feature package. But just in playing with it a bit, let’s look at it from a benefits standpoint: When you are composing long or complex documents, many are the times you want to bring up a specific section of text for comparison and verification with another—say to ensure that you had a character’s age set in an early phase of an novel, and wanted to confirm that correct age in a later instance. It’s a cinch to bring up disparate parts of a long document side-by-side in Scrivener. Speaking of characters, if you’re the kind of writer who builds a detailed profile of a character in a background document, the database structure of Scrivener means you can bring up a character study in a moment to review it against how you’ve rendered a character’s behavior in a scene. You can change the character’s profile, or change the scene or both. The Reference areas of the application lend themselves to the storage of URLs, images and data snippets relevant to the project. And if you were midway through a project started in another word processor or text editor, importing is easy, as is exporting back out, including some nifty formatting tools. I’ve written a couple of novels and a book of short stories without bothering to use a tool like Scrivener—why now? A couple of reasons: first, I’d heard great word-of-mouth report from writers who delighted in the program. But are those the ravings of people who just want to geek out with slick software, and not pointed to the ultimate outcome, the writing itself? I’ll find out. I moved to the software because the new novel I’m going to work on will be an interconnected series of short stories, all intended to have a thematic coherency. 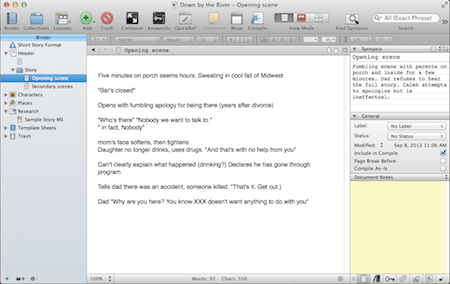 A program like Scrivener, which lets you jump back and forth through long skeins of text, move and merge elements around in a jiffy, and organize and edit lots of contributive character and scene data is perfect for the work I envision. If only it would do the writing for me. But the seed of the story that’s caught in the image above isn’t part of that novel. It’s a short story that I’ve thought about writing for a while, and I finally figured out the point-of-view and voice of the piece, and decided that I want to jump back and forth from past to present through the story. Those jumps and scene snatchings will be a perfect test for a longer Scrivener project. So, any Scrivener users among you wordsmiths out there? Thoughts? And as for that Shakespeare guy: Mac or PC? This entry was posted in fiction writing, publishing, writing tools and tagged document organization, Scrivener, Shakespeare, writing software, writing tools. Bookmark the permalink. He was a Mac guy. Somewhere in the mists is a memory of WS being miffed at Richard Burbage because RB wasn’t always on time, had issues with reliability. Can you imagine WS writing “To be, or not to –” and getting the Blue Screen of Death? Or the Blue Screen of the Black Death? Not to be tolerated, methinks. Joel, we (and the ages) are indebted to you for clearing up Willie the Shake’s OS leanings. Do you know if Oscar Wilde used tooth sticks, or did he prefer floss? As for reverse-engineering Scrivener, you are ambitious indeed. I could no more craft a database (or a blogging tool) from candy-coated code than I could make a human eyeball out of grass clippings. I’m looking forward to Canfielder 1.0. Oscar Wilde would never allow food to become stuck between his teeth. It’s not even to be considered. He simply chewed in a manner so foreign to foreign objects that they surrendered to his charm, swallowed whole, as it were. Reverse-engineering only the 5 little bits I can imagine myself using. We’ll see how my magical plan fares when it comes face to face with reality. I did, in fact, change my mind that one time. Yes, Joel, Oscar Wilde had awesome embrasures. Your ability to make me go get a dictionary is right up there with Tom’s. Though I must say, the words Tom teaches me will get used more often than the ones you teach me. Unless I change careers. Ha! You got me there. Got me right in my col.
Oh dear, now we’ve got Dr. Wilson in some kind of dental-diction fugue, probably brought on by leaking nitrous. However, I also considered how Scrivener might have been gainfully employed in the writing of TMWWMMS. But maybe even more so in the editing—I can envision that some manic cross-checkings I underwent might have been less cross. In fact, I didn’t even consider it, but it might make a fine editing tool. So Joel, this is your back-door declaration that you’re going to now study dentistry? If you’ll try to sleep with your mouth open tonight, I can start my training.